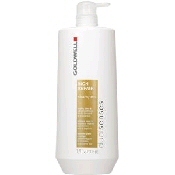 Goldwell DualSenses Rich Repair Shampoo provides gentle cleansing with repairing effects. The Repair System with Pashmina-Silk Proteins works in combination with instant Microfluid Technology for quick and even distribution through hair. Provides sleek repair for dry, damaged hair.